We are a professional men's clothing supplier gather production and sales in many years ! 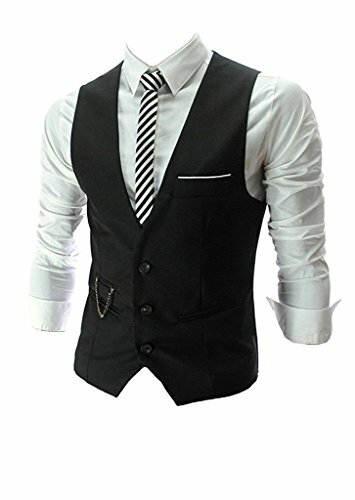 Our products mainly include men's casual pants, vests and coats. Good fabric and high quality is our eternal pursuit ! At present we have a professional customer service team ,and ensure you will have a satisfied service with us . Any question about order or products , please contact us by email ! US:S: Shoulder:15.7"/40cm, Chest:41.7"/106cm, Length:25"/63cm ,Weight:165 lb, Height:5'10"
US:M: Shoulder:16.1"/41cm, Chest:43"/110cm, Length:25.5"/65cm ,Weight:187 lb, Height:5'10"
US:L: Shoulder:16.5"/42cm, Chest:44.8"/114cm, Length:26.4"/67cm ,Weight:198 lb, Height:5'10"
US:XL:Shoulder:17"/43.5cm, Chest:48"/122cm, Length:27"/69cm ,Weight:209 lb, Height:5'10"
Men fashion classical vest:it can match with your dress shirt ,business dress suit, blazer, jacket, make you more confident. Fashion design and adjustable back buckle ! Please note the pockets of vest are not real/available pocket ! We accept full refund if you are not satisfied with our vests ,and provide good services to you . We assure vest could be handwashed and by machine both !!! If you have any questions about this product by PXS, contact us by completing and submitting the form below. If you are looking for a specif part number, please include it with your message.